I have been thinking a lot about what it means to be ‘kind' lately. 1 Corinthians 13:4 describes love itself as being 'kind'. Webster's definition of being kind is... 'having or showing a gentle nature and a desire to help others; wanting and liking to do good things and to bring happiness to others'. Other words used to describe kindness are 'loving, gentle & affectionate'. Being 'kind' is an action adjective that is always focused on someone or something. You can be kind to your friend, kind to your family or even kind to your pet. In my mind, kindness is something that is expressed that brings comfort, encouragement or help to the one who is in your focus. Often it is a very practical way to express love. Whether it is baking a cake, giving a friend a hug, or simply just being considerate and tenderhearted towards somebody else, showing kindness is a beautiful thing to behold. And the good news of this week's blog is that our Heavenly Father is the kindness Person there is in the universe! Since God is love (1 John 4:16) and love is kind, it only stands to reason that our Heavenly Papa is the ultimate expression of kindness that we could ever know. He is gentle and tenderhearted, affectionate and considerate, and very practical in the many ways that He expresses His kind heart towards us. 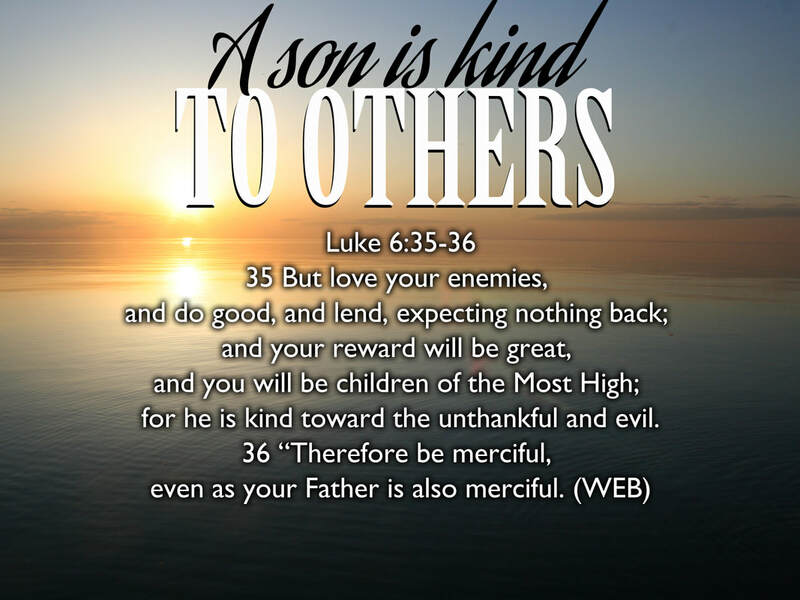 I find it interesting that in this week's Scripture, Jesus reminds us that our God and Father is even kind to those that we would consider unthankful and evil. So in essence, God's kindness is expressed to every person on the planet whether we like it or not. If you have have a hard time believing that, consider Romans 2:4 which says that is actually God's kindness that leads us to repentance (aka to change our mind about Him). Recently, I had the opportunity to put kindness into practice. They weren't big acts of service, just a few little kind gestures to those around me. I was amazed to see how much favor was released back to me from Abba as I was carried in the current of His affectionate heart towards others. I believe that simple acts of kindness are contagious and have the potential to create a domino effect that will reach even to the ungrateful and evil in our broken, lost world. But since we can only give away what we first received (1 John 4:19), we may want to ask ourselves if we are personally enjoying the benefits of God's kindness in our own lives? If not, it will be difficult to give away to others that which we haven't yet received ourselves. I am convinced that the more we can experience our Papa's kindness towards us, even in the midst of hardship, the more we will be able to express His kindness to others. In the same way that the Father loved Jesus, He loved His friends (John 15:9). Then he told His friends to love one another with that very same love (John 13:34)! That is how love works. When we are able to believe and live in the tangible reality of the Father’s affection for us, we have something to give to others. However, if we struggle to believe that God is kind towards us, we will have a tendency to be unkind towards others. It only stands to reason that this is the case because we will most likely reflect the image of who we think God really is. Unfortunately we are seeing a lot of this played out on the Internet every day through unkind social media posts & blogs. Instead of seeing love cover a multitude of sins (1 Peter 4:8), we are experiencing the exact opposite. My prayer today is that each and every one of us would be overwhelmed with the kindness of our Heavenly Dad. Even in the midst of every difficult circumstance that life can throw at us, may we be able to experience our Papa loving us through it all. The truth is that He is way kinder than we could ever possibly imagine, and it is that kindness that will cause us to repent (change our mind) about His character and His nature. As we grow in the amazing gentleness that Papa pours out every morning (Lamentations 3:22-23), may we see many new opportunities to show His affection and thoughtfulness to others. And as you ask Papa who He wants you to show kindness to today, don't forget to include yourself. If Papa is kind to the ungrateful and the evil, surely His kindness extends to His beloved kids and that includes YOU! So, let's all be merciful as our Heavenly Father is merciful and start reflecting our Papa's kindness (Ephesians 5:1-2) to everyone we meet. In doing so, we will demonstrate in practical, considerate ways that we are truly sons and daughters of the Most High… even to those who don't deserve it.